The following men’s Halloween costume ideas are available as ready made outfits from Amazon.com – just click on the image to see product details or to order. However, if you’d like to make your own homemade version of these Halloween costumes, read the accompanying how-to tips. Many of the items needed are things you may already own, while a trip to the thrift store will usually get you the basics for a very reasonable price. Check the children’s toy section in dollar stores for cheap costume accessories. 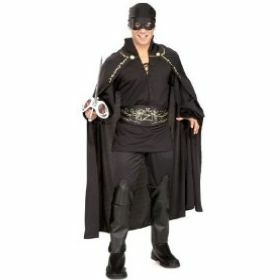 Licensed Zorro costume consists of a tunic-style shirt, pants with attached boot tops, and a flowing cape with front clasp. The belt features the Zorro emblem; a traditional Zorro headpiece and bandit eye mask complete the ensemble. Black is the order of the day to make a Zorro costume. Begin with black pants and shirt, black boots and black leather gloves. Haunt the thrift store for a stylish flat-topped black hat, and either make your own black cape and fencing sword or buy both – they are, after all, the quintessential Zorro accessories! A simple black mask completes the outfit – buy one cheap at the dollar store, or cut eye slits in a black bandana to make your own. Pilgrim costumes for men typically include knicker pants, shirt and belt; accessories such as the hat and shoes are sold separately. Roll up a pair of black fleece pants, or black dress pants, and secure with a circle of elastic just below the knee to make pilgrim breeches. Top with a black sweater, shirt, or suit jacket, with a black belt fastened over the waist of the costume. Robin Hood costumes usually feature a tunic or jerkin, black belt and a triangular hat with a feather. An oversize green t-shirt is the basis for a homemade robin hood costume. Wear the t-shirt over brown or green fleece pants or tights, and cinch it at the waist with a black leather belt. If you like, crenellate the hem and arms by sniping away small rectangles along the hem lines. Make a green triangular shaped hat from felt, or try making the old-fashioned folded newspaper style hat from a large sheet of green construction paper. A big feather will accessorize the hat perfectly! Gunslinger costume includes brown micro suede vest with attached shirt sleeves, front closure with silver color buttons & collar, a long dark coat, and a Red bandana. Also includes a bright orange plastic toy gun and a brown holster. Plan a trip to the thrift store for clothes and a cowboy hat, then head to the toy store for a fake gun in a holster, and your transformation into a high-shootin’ gunslinger will be pretty much complete. Start with a pair of dusty boots, topped by shopworn jeans. Add a white shirt and a suede vest, or simply a black shirt, topped by a long dark coat. Tie a red bandana around your neck, slip on that gun holster, and reach for your cowboy hat. Lederhosen costumes work equally well for Oktoberfest as well as Halloween. 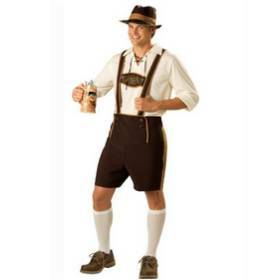 The alpine yodeller, Bavarian beer guy, or Oktoberfest reveller can all be homemade, beginning with a pair of near knee-length, dark brown shorts. Buy brown or green elastic suspenders that clip to the waistband, or simply pin two lengths of suitable wide ribbon onto the center front waistband, over the shoulders, and pin again at the back waistband. and white knee socks. Don’t forget to bring you own beer stein!